Last weekend Danny and I ventured out to Eisenhower State Park, right on the border of Texas and Oklahoma to check out some recently established bouldering. 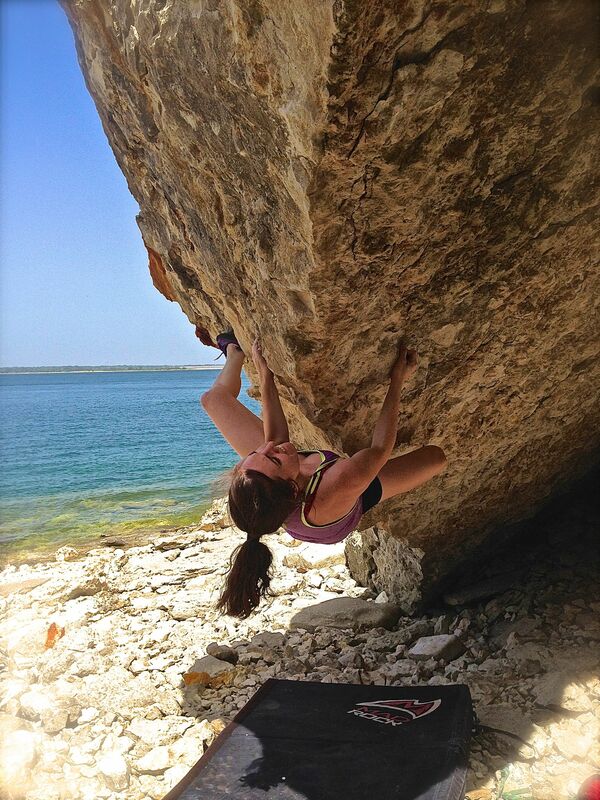 If you live around Dallas you may have heard of the bouldering out here. If you don’t live around Dallas you almost definitely haven’t. The guidebook, which was just published this year is a mere 32 pages long. Though this place has gained (slightly) more popularity recently, it’s been on my radar for awhile. 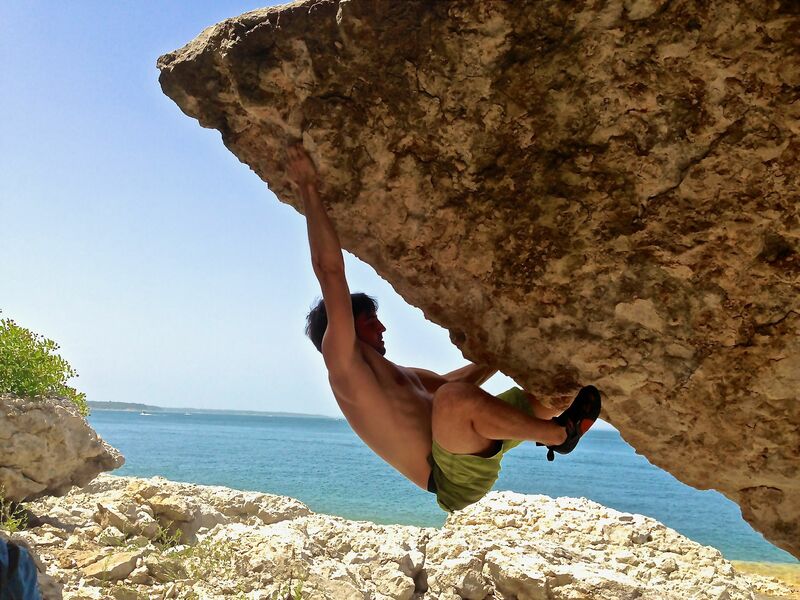 I had heard rumors of bouldering out at the park about three years ago and during one summer away from Austin I was suffering from outdoor climbing withdrawal. So I decided to attempt to climb at this nearby site. However, with no guide and very little help from the internet the trip was pretty uneventful –except for the moment when my heart stopped after I nearly stepped on a snake. However, these days some helpful climbers Matt Dendy and Eric Davies have done a lot of the exploratory work for you and published their findings in a guidebook that can purchased at gyms around Dallas. Book in hand, Danny and I made the 45 minute drive out one Saturday morning. The temps were kind of brutal–upper 90’s, but the saving grace of Eisenhower bouldering is that almost all of the boulders are located on the shoreline of a lake. Side note–there’s a yacht club on this lake. Why? I don’t know. If I owned a yacht I can say with absolute certainty that I would not spend my weekends sailing around a lake in Denison, Texas. Anyway, the lake is pretty nice for a quick dip in between boulders (no comment on the quality of this lake for yachting expeditions). Rock Quality: The rock is an interesting mix of limestone and sandstone. Seeing as these boulders receive very little traffic, there is expectedly a fair amount of choss, spiders and spider webs obscuring the climbs. I would heavily recommend bringing a brush. We did…but we left it in the car. And while we are fit enough to spend our day bouldering in the heat, we were way too lazy to walk the 5 minutes back to the car. Which brings me to…. Approach: There are several different bouldering pockets around the lake and almost all of them have close parking. The first area we went to, Elm Point had a really short approach, absolutely no scrambling required. The next pocket of bouldering, Deer Haven, included a bit of weed-whacking through the forest and a pretty short downward scramble. If you have a decent amount of climbing experience and have spent any time scrambling to get to climbs this will not be an issue. If you’re bringing a friend who is not used to leaving the comfort of their couch except for hiking over to the kitchen for their daily hot pocket then they might be a little concerned by the approach (but you can probably convince them to make it down, if you have the forethought to bring a hot pocket to coax them with). Climbs: We spent the first hour or so warming up on climbs in the V0-V3 range. The climbs were not particularly tall and generally had flat landings (at least at the boulders we visited). We spent another hour or so working problems at the Art Boulder (in Deer Haven), which is supposed to be the highest quality boulder in the park. The problems were definitely picturesque with the water in the background. The lines had interesting movement, and we both had fun working out the body positions. One thing to consider is that this place doesn’t have a plethora of chalked-up holds so determining the appropriate start holds can be puzzling. Overall, I would say that this place is definitely a great area to take a beginner who is ready to venture out of the gym and into the great outdoors. The easy approaches, abundance of V0-V3 climbs, and the added appeal of the lake will make for a fun afternoon. While I wouldn’t recommend the 97 degree temps that we climbed in, I would recommend climbing there while its still warm enough to hop in the lake. If you are an experienced climbing veteran, don’t expect the new Hueco Tanks. Set the bar low, expecting some choss and enjoy the adventure of finding new climbs. Maybe you can even put up some FA’s! Hope you enjoy this video documenting some of the climbs from the park! I LOVE your blog! My husband and I just moved kinda close to ESP and were trying to find a guide/reviews for the bouldering there. I wish we had a gym here but I also just read your post on a home wall and now I might just have to go to home depot. Thanks for documenting your climbs! Sometimes mnt project doesn’t really have enough! Awesome! So glad to hear! Those DFW gyms (summit and canyons) are pretty great too. Hope you get a chance to climb there. also im from fort worth too!